Good Afternoon! After what seemed like an eternity, RBNY is back in action @The Cathedral of Football, with the always tough to beat Seattle as the opponent (7:30pm ET, MSG Network). After a lackluster MLS Fist Kick perfomance this past Tuesday, where LA handed them a big fat loss (by way of a Juninho Golazo), the Sounders will be looking for all three points. In a bit of a shocker this past week, the Sounders parted ways with one of their Designated Players just hours before the Galaxy game. A Club In Crisis? Red Bulls fans can only hope. Last year the Red Bulls lost 1-0 on a late goal by Freddy Montero. This year I predict that they turn the tables on the Sounders and win 1-0, with none other than Thierry Henry opening his account. Like Matt, I'm going to start the season on the optomistic side. Seattle was horrible against The Galaxy this past Tuesday and the short rest period/long distance travel isn't going to help their cause today. That said, they do have Red Bulls killer Freddy Montero on their roster. But I'm thinking that, today, even he won't be enough to get them even a tie at The Cathedral of Football. My prediction: 1-0 to the mighty Red Bulls. Much was made of Thierry Henry's comments that it didn't matter to him whether he scored or someone else did. Of course, he meant that whether the goals come from his foot directly, or if he can help a teammate put the ball in the net, it didn't matter to him; that the team winning is more important than any individual performance. Exactly what you'd want the new captain of our team to say and believe, right? But folks freaked out anyways: "We aren't paying you $5 million to NOT score goals," "If you're not going to do it, who will?" etc. Well, tonight he puts those overblown reactions to rest, as the Red Bulls win 2-1 on a brace from Henry. For the Sounders, a Zakuani cross to Montero creates a goal that a more acrobatic keeper than Sutton would have stopped. I'm a pessimist - and it's getting worse each day I'm affiliated with Matt! - so I doubt many of my predictions this season will be wins. Starting with this one. 1-1 draw, spoils shared. I can't see Seattle Sounders starting the season with two defeats, and we're far too disjointed with injuries and keeper problems to ease to victory. Montero to open scoring but Richards to pick up where he left off last season. Alrighty then! Look for our Award Winning matchday coverage within the next day, or two. Let's Get Pumped Red Bulls fans! 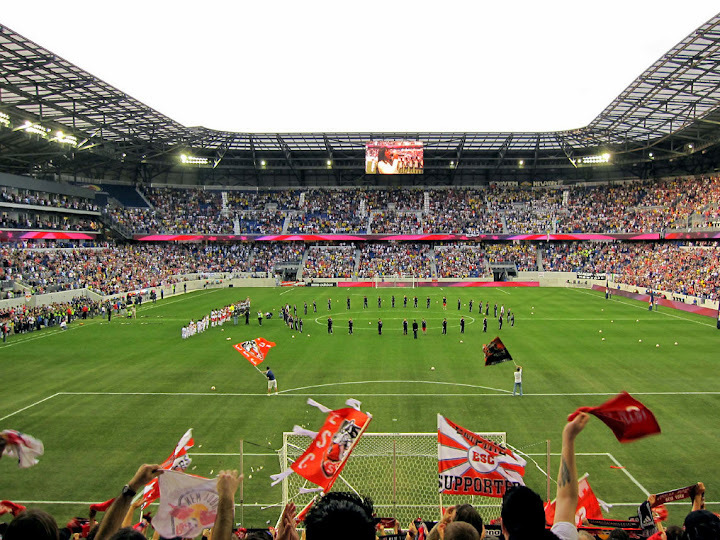 I hope to see you all at The Cathedral of Football, Red Bull Arena (built by Makita). Viper Out!